I listen to a few podcasts regularly using a RSS feed reader. Recently, I decided to try the Player FM podcast app on Android to make this more convenient. I must say that it has turned out to be a great little app for podcasts. Discovering my podcasts worked directly, I did not have to bother with any URL or RSS feed. Search for podcast name and add it to Subscriptions. 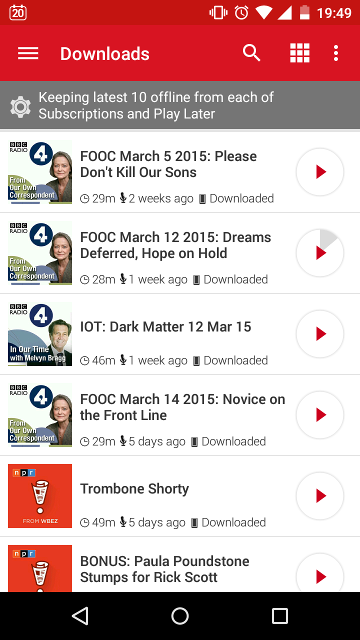 Latest episodes of any subscription are directly downloaded and added to a Downloads playlist by the app. The app can be configured to download only over wifi, if you want that. There might be times when you want to listen to a particular episode from a podcast you do not want to subscribe to. Player FM can handle that too. This can be added to your Downloads playlist too. The playlist will maintain the last 10 episodes from each Subscription. Episodes which you play close to the end or to the end are automatically marked as played. The app can also be configured to be offline all the time. You can make it download only when you want it to.